The Safari Beach Hotel Mombasa is a 4-star hotel resort, with a brilliant view of the Indian Ocean along the Diani Beach, north of Mombasa city. 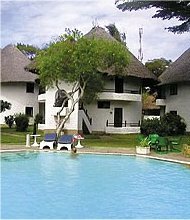 The rooms at the Safari Beach Hotel Mombasa are arranged in thatch-roofed "villages", creating a lush African atmosphere. There are more than 220 rooms at the hotel, with many high-class suites also available. The rooms are modern and well-decorated, as the hotel has been renovated several times since it opened in 1986. You can enjoy an elegant sit-down dinner at the Island Grillroom or Village Restaurant. The Village is open all through the day, but the Island Grillroom is for late dinners only. Both specialize in local seafood dishes. Quicker snacks and casual meals can be had at the Beachcombers Brasserie, the Sportsman Club or the ice-cream parlor. There are 4 different bars, though none are open particularly late. If nothing available happens to suit you, there is 24-hour room service for all guests. All rooms have basic features like private phones, a mini-bar and safe, private bathroom and balcony. There are no TVs in the hotel rooms, but there is satellite TV at the Safari Sands club. If you're traveling with several people, many rooms are conveniently connected. For the business traveler, you can find a 100-person capacity conference room and services such as Internet access, fax and other services for the corporate guest. There's also complete financial Forex services. There’s scuba diving, wind surfing and swimming along the white sands of Diani Beach. The coral reef makes for excellent snorkeling too. Two swimming pools, tennis and squash courts, and a fully-equipped fitness center can also provide some sporting fun when you're not out on the beach. If you haven't already planned and booked your other tour destinations, you can visit the guest relations desk for help arranging safaris, local tours and transportation to the airport or railway station. 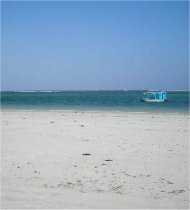 The hotel is located on Diani Beach, about 20 miles south of Mombasa city. You can easily get to the hotel from either nearby Moi International Airport or the Mombasa Railway Station, both around the same distance away as Mombasa. The popular Tsavo West National park and animal reserve is a 2-hour drive away. It's one of the largest game sanctuaries in the world, and a must-see destination when you are staying at the Safari Beach Hotel Mombasa. Read user reviews and compare this hotel at my favorite hotel review site Hotels Combined.